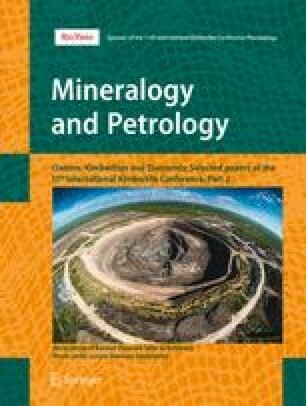 The Kennady North Project kimberlites (Northwest Territories of Canada) comprises multiple shallow dipping dykes and several volcaniclastic bodies that have an unusual shallow plunging geometry and complex “pipe” shapes that are termed chonoliths. The detailed exploration of the entire system provides exceptional evidence for subterranean volcanic conduit growth processes. The possible processes leading to the development of the kimberlite bodies are discussed, with emphasis on the importance of the subsurface intrusive system geometry and the local stress tensor. Emplacement into a locally compressive stress regime (i.e. σ1 and σ2 inclined at a low angle to surface) could change the kimberlite emplacement geometries to that observed at Kennady North. Models are proposed for the development of the chonoliths, to emphasize aspects of the growth of kimberlite systems that are not well understood. The conclusions challenge or evolve current emplacement models and should influence kimberlite exploration and resource definition assumptions. The online version of this article ( https://doi.org/10.1007/s00710-018-0621-8) contains supplementary material, which is available to authorized users. The authors would like to acknowledge the organizational committee of the 11 IKC for an exceptional conference and the opportunity to submit this manuscript. The gracious support and many detailed and thoughtful recommendations from Bruce Kjarsgaard, was greatly appreciated. The reviewers, Herb Helmstaedt and Eric de Kemp, are also thanked for their reviews that helped improve the message. Janine Kavanagh is thanked for pointing us towards the term “chonolith”.